Are you looking for a perfect method or solution to access laptop camera from android phone? If YES! 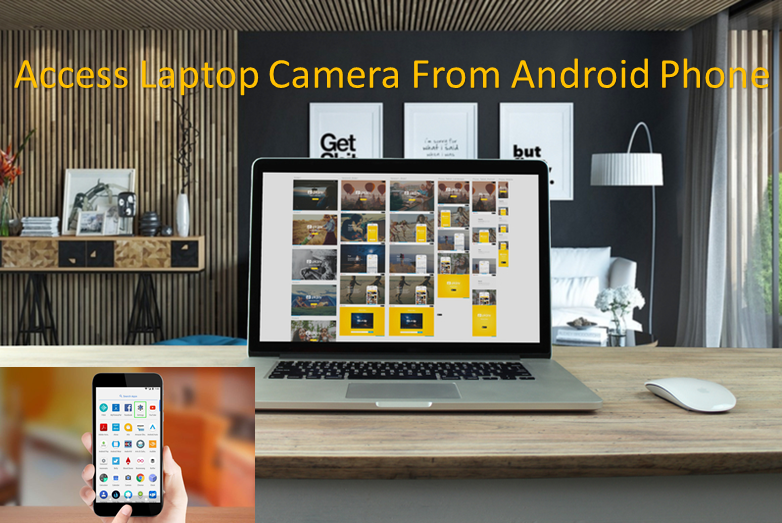 then today here I am going to share some easiest methods that you can use to stream laptop camera to android smartphone anywhere and spy your home or office easily. So once you do this with our method, after that you don’t need to pop-out this question “how to access my laptop camera from my android phone” in your mind again. Because you are going to read some best method available in the market to view my laptop camera remotely using android. These days people used to install security systems featuring camera monitoring system which can be controlled via Smartphones easily whether it’s an Android or iPhone, but from today onwards you can configure this functionality using your PC’s Webcam and an Android Phone. Today we have remote desktop apps such as “Splashtop Remote Desktop” & “PhoneMyPC”. Yes, it is kinda tough to access the whole area on a small mobile phone screen but for spying it is the easiest method with the combination of PC or Laptop webcam and an Android Smartphone. How “Remote Desktop Apps” Works? Basically, Remote desktop apps need two main parts to access laptop camera from android phone, So let’s dig into this section and know how it actually works. Remote App for Android Mobile (Where you access the real footage). Both above components are required to stream laptop camera to the android phone easily. So we are going to share two remote desktop apps with all of you where we are going to cover the desktop section and mobile section individually. Below we have shared two remote desktop apps which you need for access laptop camera from android phone. So read carefully and then choose best one for you. Splashtop Remote Desktop Software was reviewed by World Famous PCWorld and they give it full marks for remote desktop security. They found the installation part is easy to follow and once you installed it on your PC then your phone will easily catch all hosts running via Splashtop streaming software. This software helps smartphone to with desktop view stretched so it can fit on all mobile screens, though you can also use finger swipes and pinch to zoom functionality to access the area covered by your laptop cam. You can install Splashtop Remote Desktop app on Android and launch the apps and the software you installed on PC and you need to set a password to access with security. Once you set the password on your software then open the app on your Android phone and enter the same password for security. If you are on the same network then your PC software will automatically detect the app and if you need to access the footage from any other network then you can upgrade to the higher level called “Anywhere Access Pack” and once you upgrade to this service you can access footages via the internet from anywhere in the world. It is one of the most trustable and highly demandable remote desktop apps for full access, & PhoneMyPC offers webcam functionality to their users. Where users can use webcam without opening the camera software. Once you activate the functionality from your mobile device app, PhoneMyPC will automatically enable the camera view. Though according to PCWorld, this performs sluggishly sometimes and show zigzag images. But we hope this can be fine for the OTA update. These are the best apps to access laptop from android and all the apps given above are completely free. You don’t need to pay a single penny to anyone for downloading these apps on your device. You can use any of the above-given apps to access laptop from android phone easily. Try the app you like the most from the list given above and let us know which one works great for you in the comment section. Our final verdict is to suggest you give a must try to “Splashtop” app and some users also can try PhoneMyPC too. So we hope you find this post on “Access Laptop Camera from Android Phone” useful and if you like it then do give it a SHARE on Social media handles. If you have any query regarding this topic then you can drop your queries in the comment section below and we will get back to you as soon as possible with a proper solution of your query.